If you want to enjoy the warm summer nights of southern Alberta, you will find several options for camping within and around Waterton Lakes National Park. 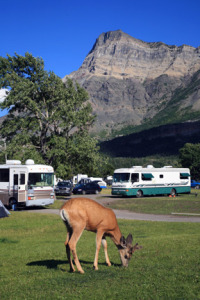 One of the most unique features about the Townsite Campground is the abundance of wildlife. Waterton Lakes National Park has three campgrounds holding 391 campsites. Reservations are taken for some sites at the main Townsite Campground through the Parks Canada Campground Reservation Service (877/737-3783, www.pccamping.ca). The three campgrounds detailed below are open only in summer. The rest of the year, camping is allowed at the Pass Creek day-use area, along the park access road. The most popular camping spot–thanks to a central location and top-notch amenities–is the Townsite Campground (mid-Apr. to mid-Oct.), within walking distance of the lake, trailheads, restaurants, and shops. Many of its more than 238 sites have power, water, and sewer hookups. The campground also offers showers and kitchen shelters. Walk-in tent sites are $23, unserviced sites $28, hookups $39. The quota of unreserved sites fill quickly each day (especially in July and August), so to ensure a spot, try to time your arrival before check-out time (11 a.m.). The 129 sites at Crandell Campground (mid-May to early Sept.), 10 kilometers (6.2 miles) from the town site on Red Rock Canyon Parkway, are sprinkled through a lightly forested area of the valley bottom. Fees are $23 per site per night. This campground has flush toilets and kitchen shelters but no hookups. Pleasant Crandell Lake is an easy 2.4-kilometer (1.5-mile) walk from the southwest corner of the campground. Belly River Campground (mid-May to early Sept.), 26 kilometers (16 miles) from the town site along Chief Mountain International Highway, is the smallest (24 sites) and most primitive of the park’s developed campgrounds. Located beside a shallow, slow-moving body of water, facilities are limited to pit toilets, a kitchen shelter, and drinking water; sites are $17 per night. Campfires are not allowed at the Townsite Campground, but at the other two facilities, an $8 fire permit includes unlimited wood. Waterton also holds 12 backcountry campgrounds. Each has pit toilets, a cook shelter, and a water supply. Open fires are discouraged and are prohibited during periods of high fire danger; check with a warden. If you are planning to camp in the backcountry, you must obtain a Wilderness Use Permit from the Waterton Visitor Centre or the administration office. Permits are $10 per person per night. Half of all sites can be reserved in advance. If your planned backcountry itinerary takes you over the border, ask at the information center about border-crossing regulations. You’re a little way from the action at the commercial campgrounds outside the park, but the wider range of facilities (especially if you have a young family) and the peace of mind in being able to reserve a site with hookups make them a viable alternative. Waterton Springs Campground (3 km/1.9 miles north of the park gate on Hwy. 6, 403/859-2247 or 866/859-2247, www.watertonspringscamping.com, late May to Sept., tents $18, hookups $20 to 35) centers around a large facility building holding modern bathrooms, a lounge, a general store, and a laundry room. Also on-site is a playground and a fishing pond stocked with rainbow trout. Some sites are a fair walk from the main bathrooms. On Highway 5, six kilometers (3.7 miles) east of the park gate, is Crooked Creek Campground (403/653-1100, May to Sept., $25 to 29), operated by the not-for-profit Waterton Natural History Association. The sites are close together, so it’s best suited to RVs. Family fun is the order of the day at the Great Canadian Barn Dance Campground (Wynder Rd., Hill Spring, 403/626-3407 or 866/626-3407, www.greatcanadianbarndance.com, May to Oct., unserviced sites $28, hookups $32 to 38), a converted farm lying 40 minutes along rural roads from the park. As the name suggests, the action revolves around a Saturday evening barn dance, held in an authentic barn. A casual roast beef dinner is included in the admission of adult $42, child $12.50. Although the facility is busiest on weekends, you can camp through the week, with activities such as swimming and canoeing to keep the young ones happy. To get there from Waterton, head 18 kilometers (11 miles) east on Highway 5, 21 kilometers (13 miles) north on Highway 800, and then 1.6 kilometers (one mile) east on Highway 505 to Wynder Road.